South Shields qualified for the final of the Durham Challenge Cup for the second time in three seasons with a 3-1 win at Northern League leaders Dunston UTS. The Mariners established control from the outset and took a two-goal lead with strikes from Nathan Lowe and Robert Briggs. Jake Stafford pulled one back for the hosts on the stroke of half-time and Dunston performed better in the second half, but a penalty from Robert Briggs late on sealed Shields’ passage into the final. They will meet Shildon in the final after their 2-0 victory at Hartlepool United. Shields were backed by a large and vociferous support at Dunston, and enjoyed a fine opening to the game. It was Dunston who went closest early on, though, when Liam Connell was forced into a decent save after Michael Pearson was played in. Lowe saw plenty of possession in the early stages and was rewarded for his bright start when he belted the ball into the bottom corner from 20 yards. Dunston had two chances to pull level soon after, but a Pearson volley was deflected just over and Connell comfortably kept out an Andrew Grant-Soulsby header. The Mariners were impressive going forward and almost made it two when Ben Harmison laid the ball off for Luke Daly and he smacked an effort against the post. Shields scored their second just before half-time when Harmison chased what seemed a lost cause, cleanly won the ball and played it to Foley, who hammered it home from the edge of the box. Foley almost made it a quickfire double when he was played in after some fine one-touch football, but he was denied by an incredible last-ditch block. He had a further shot deflected into the side netting before Dunston pulled a goal back on 45 minutes when Stafford had an effort saved before turning in the rebound. The Mariners were less impressive at the start of the second half and would have conceded an equaliser had Daly not cleared a Pearson header off the line. Connor Bell turned in a superb performance on his first start for Shields but was kept off the scoresheet, with his best chance seeing him fire narrowly over. Harmison and Darren Lough both went close to restoring the Mariners’ two-goal lead before Briggs was presented with a golden opportunity to do just that after Foley was fouled in the area. Briggs buried his spot-kick into the corner of the net to end any lingering doubts about Shields’ victory. 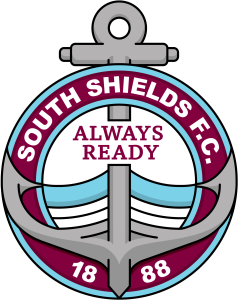 SOUTH SHIELDS: Connell, Mouanda, Adams, Lowe (Turnbull 76), Morse (Bexton 54), Lough, Foley (Mason 86), Briggs (c), Harmison, Daly, Bell. Subs not used: Baxter, Guy. Goals: Lowe (8), Foley (29), Briggs (pen 83).